Practice the ancient, revered art of calligraphy � with a modern twist. 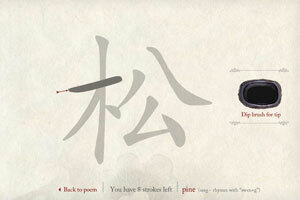 Dip your �brush� in the inkwell and trace the Chinese characters from one of the Qianlong emperor�s poems. Developed and installed at the Peabody Essex Museum. In the museum you can use a Sumi brush on the screen for the ultimate interactive zen experience.